At least one person dies or has a serious injury every 10 days on the A90 as new figures reveal the road to be the most dangerous in Scotland. Between 2013 and the end of 2015, 113 people have either died or have been seriously injured on the stretch of road between Dundee and Fraserburgh. Not due another upgrade until 2026 the A90 has long caused concern among drivers and politicians who want to see the road undergo major changes. The dualling of the A90 to Fraserburgh and Peterhead and the junction at Laurencekirk have been part of major discussions on the problem road. There are now plans to build a flyover at Laurencekirk but the project could take up to ten years. 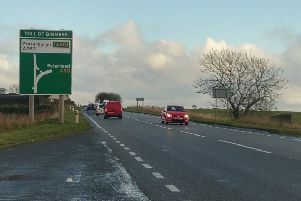 New proposals to dual the A90 as far as the Toll of Birness just north of Ellon stops some way short of the dualling to Fraserburgh and Peterhead that many had hoped for. Mike Rumbles, Lib Dem MSP and the party’s transport spokesperson, said: “Since 2013 we have seen year on year increases in the number of serious or fatal accidents on trunk roads under the management of the Scottish Government. He added:“Clearly, major infrastructure projects take time. A Transport Scotland spokeswoman said:“Every road death is a tragedy – that is why we are committed to working with local authorities and other key partners to deliver the priorities and casualty reduction targets set out in Scotland’s Road Safety Framework to 2020. The transport authority said that fatal accidents have reduced on the A90 between 2013 and 2015 by 25%.